I have picky eaters in this house. They get it from their daddy. I have decided that each week, we will try to learn to like something new. 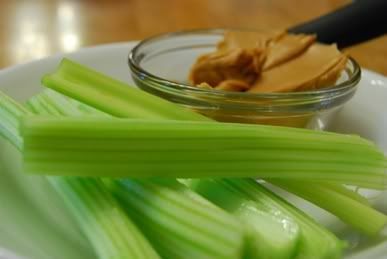 This week, we are learning to like celery. How did the boys respond to this today? That was much easier than I anticipated. Now to think of what we'll work on for next week. Perhaps broccoflower might be pushing it... at least for now (and especially since I don't even know if *I* will like it!). Did your parents make you learn to like certain foods when you were growing up? While my dad didn't exactly make us learn to like cow tongue when we were little, he did force us to try it! Blech!!! Although I do believe that my sister Lele threw a fit or maybe ran away or something to avoid having to eat it. She was always smart like that. There are definite drawbacks when grandma and grandpa have a farm and cows.